Just what is Vancouver Aquarium's relationship to SeaWorld's beluga program? Funny you should ask. It turns out that Vancouver Aquarium owns nine belugas, but only two actually live here. Seven others either live or were born at SeaWorld, a self-described theme park and entertainment corporation. Vancouverites have a love affair with the Vancouver Aquarium beyond anything we feel for other local institutions, so it's not so surprising that the city's park board decision to halt breeding of cetaceans inflamed emotions on both sides. Add some overheated rhetoric, a prematurely uncorked civic election campaign and Jane Goodall, and we managed to whip this thing to peak hostility virtually overnight. Both sides should dial this way back. The Vancouver Aquarium is a scientific and research institution of the first order, and clearly its highly professional scientists, academics, volunteers and staff care profoundly and personally about the animals in their care. It should also go without question that the public is widely, fairly and increasingly concerned about the welfare of captive cetaceans. As are many scientists. Yet Dr. Goodall's letter to the Vancouver Park Board deserves a much closer reading than it's had thus far, because she's raised a key issue. Goodall focused on the scientific ethics of Vancouver Aquarium's loan of belugas to SeaWorld's breeding program. And just what is Vancouver Aquarium's relationship to SeaWorld's beluga program? Funny you should ask. It turns out that Vancouver Aquarium owns nine belugas, but only two actually live here. Seven others either live or were born at SeaWorld, a self-described theme park and entertainment corporation. Two of those seven have since been moved to a third aquarium in Atlanta. 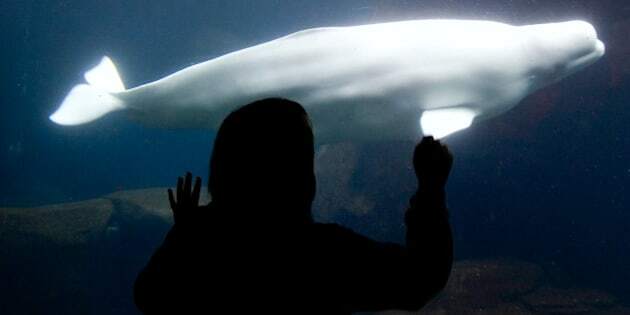 Vancouver Aquarium belugas routinely perform in shows at SeaWorld, participate in celebrity promotion for SeaWorld, and are made available for in-tank interactions with the public. But most of all, Vancouver Aquarium whales form the backbone of SeaWorld's beluga breeding program. According to Ceta-base, a credible (though volunteer-run so not infallible) cetacean tracking site, two Vancouver belugas Nanuq and Imaq are the only successfully breeding males in all SeaWorld's North American facilities. They've apparently sired every living beluga born at any SeaWorld on this continent since August 2000. Vancouver Aquarium's Nanuq is by far the most successful beluga breeding male in SeaWorld, with seven living offspring. Six other offspring did not survive birth or early infancy. Nanuq was so successful that he became the subject of an intensive experimental artificial insemination program at SeaWorld, which may or may not be ongoing today. For at least two years prior to 2010, he was removed from the water approximately 42 times for the manual collection of samples. This program also hormonally induced ovulation of multiple females, who were inseminated on dry land. Three calves were conceived through this method, including a pair of twins that died within weeks of birth. Atla, the single surviving calf, now aged four, belongs to Vancouver Aquarium but lives at SeaWorld San Diego. Is this what John Nightingale had in mind when he said the Vancouver Park Board is picking a fight with Mother Nature by directing an end to cetacean breeding? What is the compelling scientific or ethical defence for this treatment? Of SeaWorld's 19 beluga whales, nine either belong to Vancouver or were sired by Vancouver whales. Nanuq has just been flown to Orlando, where he's being promoted on local FOX News as SeaWorld's "most eligible bachelor." Apart from the very troubling moral, ethical, and financial concerns raised by treating cetaceans as celebrity livestock, the genetic implications are obvious. This may be why SeaWorld joined a consortium attempting to import 18 wild captured belugas currently being held in Russia. The Vancouver Aquarium has enormous credibility as a conservation champion on the vanguard of cetacean care. Yet it's been overtaken by events, not to mention other aquariums. The US National Aquarium in Washington/Baltimore voluntarily halted reproduction in its eight dolphins in 2012. Perhaps this is not the Herculean task we're led to believe. And just weeks ago, John Racanelli, CEO of the National Aquarium, announced the potential retirement of its entire dolphin population to a new marine sanctuary. Recently the New Yorker covered its transformative BLUEprint process to re-invent the modern aquarium experience in response to changing times. Vancouver should join the National Aquarium at the forefront of the 21st century aquarium movement, instead of fighting a rear-guard action to defend artificial insemination and trick shows at SeaWorld. We should join institutions like the Monterey Bay Aquarium, which partners with the U.S. national marine sanctuaries, the Aquarium of the Pacific in Los Angeles, Boston's New England Aquarium, and San Francisco's Steinhart Aquarium. Each attracts much larger attendance than the Vancouver Aquarium, without whales or dolphins. "This is a policy issue that is largely a moral issue. What it needs are contributions to understanding the complexity of the issue, both empirical and ethical, from a broad array of informed and committed persons/groups, including from the community, and a process that engages diverse, conflicting views to arrive at a responsible decision." Due to the nature of the Vancouver Park Board motion, this issue will be with us for some time to come. Let's step back from the character attacks, put partisan politics aside, and seek a clearer understanding of all the true facts. We can welcome debate that includes the full range of the scientific and research opinion, thoughtful citizens, and organizations like Canadian Federation of Humane Societies, the BC SPCA. Our whales and dolphins deserve it.